So many costumes, so many conventions for them to show up at! Japan is just full of interesting video game events, it seems. They also aren't afraid to have costumes made for each of the popular characters, even changing their Sonics around for his different looks, as you'll see on this page. Here's another shot from a game show. This mascot may seem at first, like the others, but look at the shoes. They've bothered to re-create Sonic's fancy 'soap shoes' from the grind-heavy Sonic adventure 2, and applied them to this costume character! The detail of the Soap Shoes gives this arm-flapping mascot an interesting look. Also note that the eyes are shiny, meaning they used plastic instead of white fuzzy stuff, to improve the look. As time goes on, their costume characters just seem to keep improving! Credit to Flare for finding the photo. What is a mascot suit doing hanging around Michael Jackson? 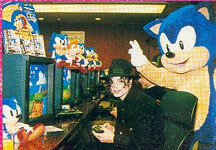 I guess they're promoting Sonic 2...but one has to wonder if MJ is really a sonic fan? You can see the promo flyers, poster, and mess of Sonic & Tails dolls hanging around over the oldschool looking (and rather small for demo-ing) TVs. Everyone knows that MJ hangs around in the USA, but he's also known to go all over the place promoting things...or at least he used to. It's debatable where this photo is from (Japan or the USA being the likely-est areas) Still, things like this are interesting to see. Photo discovered by Rae_Logan. These suits all took part in a skit in 2003, somewhere in Japan. This is a rather cute photo. What do the mascot suits look like from the back? It's a curious question, and one that's not that easy to answer, as most photos done are 'glamor shots' where it always tries to get the best angle of the suit. 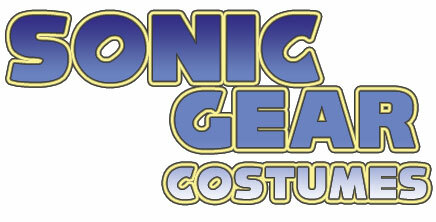 However, SonicGear is here to show every angle of everything Sonic. So, while it might not be glamerous, here are the backs and edges of some of the suits. Here's Rouge the Bat, from the back. You can see they really went to a lot of trouble sculpting her 'hairs' at the bottom of her head. Her wings are about as expected (one solid piece on her back) and you can even see the little gap beneath them. Her boots hold up well to inspection too, from behind. In the left photo, two people at this convention were walking with her, seemingly palling around, but one of them is taking the chance to pet her hair. Tails didn't fare as well as Rouge, likely due to lack of detail. You can see the zipper streight away, where hers is likely buried in the wings. 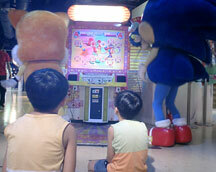 They neglected the little curl of hair on the back of Tails' head too, likely it was small and difficult to place. From the back, the body is still appropriately shaped, though. However, though there isn't really anything anyone can do about it on a suit like this, the tails are really rather small and wilted looking. 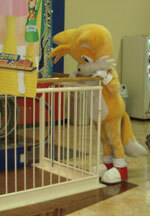 The problem with Tails suits being how to solve this problem, that's also the character's main feature. Amy is pretty decent as well, though she looks slightly 'wide' or a bit 'fat' in this one. They got her spikes/quills quite right, even detailing them in over her head. The dress looks fine and normal, and her shoes are nice and big as well. They've also paid attention to her tail, which is good. You can still quite see the zipper, but there's not much to be done for it. This is a rather funny looking suit from somewhere in Japan. It has super small hands with large rings for the glove cuffs, and no neck really at all. The whopper head is just sort of planted on the rather large body. This gives Sonic a look more like the 'classic' style where it was rather squat and round. This must be in a mall; of some sort you can see a "Crazy Crapes" store in the background. The photo was obviously taken 'with' someone, but who knows who it is, so he's cropped out. Still, it is interesting to see where mascot suits may appear. Here's another, different mascot suit. This one appeared at a convention But, you can see it's flaw here is that the hands are waaay too tiny, and it just makes him look wierd. However, you can tell the spikes really had a good plan for them, as they're properly shaped, non-floppy and look quite nice in general. It looks pretty seamless, and the smooth fabric really helps it. The USA and Mexico aren't the only lands where Professional Wrestling is popular! It's popular in Japan too. 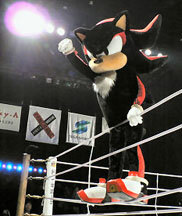 In this case (likely to promote the Shadow game) a Shadow mascot character has appeared in the ring! It's even climbed onto the ropes at the edge, to help fire up the crowd. This suit appears similar to the SA2 Battle suits seen on the page, but the setting for it is quite unique. The lighting makes the arms look a bit strange, and the hands are slightly small, but it's good to see Sega really promoting things. 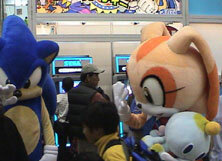 With Sonic Unleashed/Sonic World Tour soon to be released in 2008, both of these mascots showed up at the Tokyo Game Show. 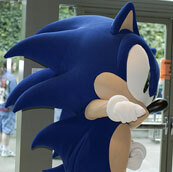 The left-side regular Sonic looks good, with a well-done head and even some sculpted (though not useful) hands. The Were-Hog looks especially good because it's proportions are more gorrilla/ape-like which means humans can fit into it better. The hands are again, sculpted, but this time they're pale blue plastic, and somewhere along the line, he's lost a finger! (count them) They've even got the spikes on his sneakers. (Ok how do inanimate shoes mutate?) Still, the suit looks appropriatly menacing/annoying depending on your were-hog perspective. 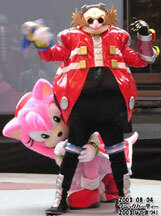 In Japan, they even dress up the mascot suits! 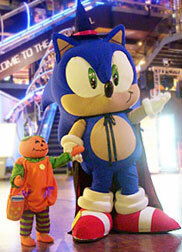 Here, a Sonic suit is dressed like a wizard, complete with cape and pointy hat. Since the suit's head is so big, the witch hat looks small and sort of funny on it. The suit itself is more classically styled, with quite a round body, huge head and 'stuffy' arms and legs. It's somewhat reminiscant of a plush. Still, a costume in a costume is rather curious! A close up shot of the Cream suit still carrying around the Chao Cheese. With this detail, you can see they really took good care in making this suit. Everything but her hands looks quite like her! The ears are fully 3D, and even floppy. This is a really good suit. 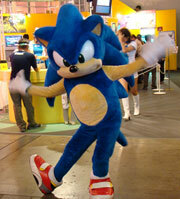 Sonic 360 Event suit. 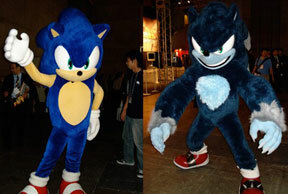 This mascot suit appeared at what looks like it could be a preview or possibly launch type event for Sonic 360. 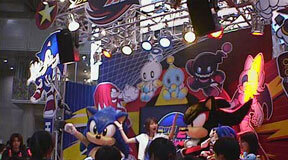 You can see this is still the older soap-shoed mascot suit, but the Sonic/Silver/Shadow banner in the background tells you what the event is. Also, there's clearly a line going on where people are likely waiting to play the game. 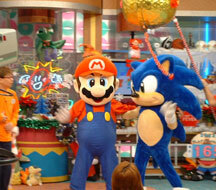 Mario & Sonic together, for some reason. But why are they standing under a gold ball? The gray box to the left is a TV style big camera, and those are indeed pokemon on the floor near the store. This was obviously filmed, but why?